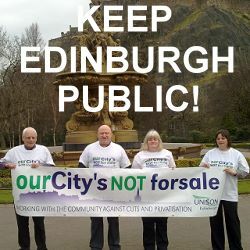 The “Our City’s Not For Sale” campaign will work with other unions, community groups and the public to expose the dangers of the council’s ‘alternative business models’. “Services like front line customer contact, revenue and benefits, catering, cleaning, security, cleansing and vehicle and grounds maintenance, along with HR are all up for grabs with cultural services, transport and legal services also being primed for outsourcing through multi-million pound ‘strategic partnerships’ or ‘joint ventures’ – privatisation, to you and me”, said Agnes Petkevicius, UNISON Edinburgh Branch Secretary. “UNISON’s own studies have revealed that, at best, council claims about savings are wishful thinking. No credible evidence exists to support them. Worse still, the evidence that does exist points to failures, worse services, increased costs and huge bills to bring failed services back in-house. “To go ahead with this, in an exercise likely to top £1million wasted on consultants, without learning the lessons of the social care tendering fiasco is nothing short of reckless”. “If services are delivered in-house with no need to make a profit, how can they be delivered more cheaply while making a profit on top? Something has to give and that is usually the quality of the service or indeed the whole service – along with any decency in the pay and conditions of those delivering the service”, added Branch President John Stevenson. “You still pay your taxes but instead of the money going on the service and those who deliver it, it goes to company profits. Like the banks, or even perhaps the trams contract, these companies will become ‘too big to fail’ and will have the council over a barrel. It is time for the council to abandon these plans and concentrate on efficient and quality services in-house”. UNISON lead negotiator Kevin Duguid said, “The union has stressed that it is always ready to fully engage with the council on better and more efficient ways of delivering quality services. “However, the refusal to seriously look at in-house options means there is no real attempt to look at improving services, just a headlong drive to privatise”. “Nowhere is this more evident than the council leaving key issues out of the tendering advert like bidders having to comply with legal requirements such as the equalities duty, Climate Change Act etc, in case it deters them from applying”.